If your kids are Disney fans, they will love these free princess pumpkin carving patterns! Which Disney princesses are your children’s’ favorites? My girls are such polar opposites. Same house, same parents, yet each of them have their very distinct interests and preferences. The older one is a tomboy and obsessed with things that are typically thought to interest boys.
) wherever her story ended. Most years we go through a lot of pumpkins. My girls are Halloween obsessed so as soon as October hits, they’re ready for the decorations and pumpkins. Well when the weather is still in low 90s at the beginning of October, a pumpkin usually doesn’t have a great shot of lasting until Halloween. Weather permitting, we can only get 10 days or so tops before it’s time to carve another batch. To keep both girls happy, our pumpkins are usually completely different to suit their tastes. I shared a post with 10 Free Superhero Pumpkin Carving Patterns my oldest insanely happy! But the younger one wants something that’s more feminine. More her. So I started a search for Free Princess Pumpkin Carving Patterns and my little one was pretty excited with what I found. This one looks like Aurora when she is sleeping. I like the one of her asleep because it’s kinda creepy…she’s not quite dead. And that is so very “Halloweeny.” Don’t you think? Print the Sleeping Beauty pattern. Rapunzel is a very popular Disney princess and this pumpkin carving stencil is super easy to use. It’s a fantastic one to try out if you haven’t ever carved a pumpkin before. Print the Rapunzel template here. Elsa is another very popular Disney princess. Is everyone still singing “let it go”? This template is easy as well, but it is a bit more involved. You might need to help out less experienced hands. Print the Elsa carving stencil. I’m a huge fan of Aladdin and so are my girls! I love how simple Jasmine’s carving template is. I think you will too! 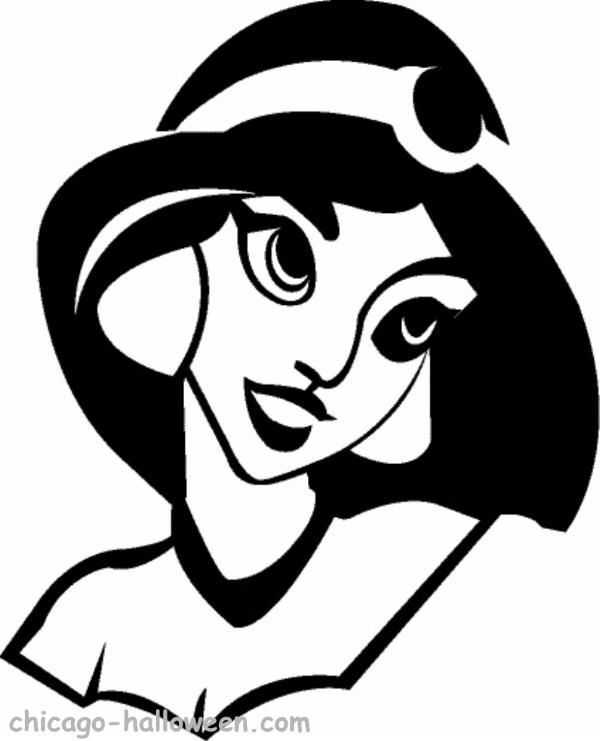 Print the Jasmine template. Younger artists should be able to carve this one pretty easily. The Little Mermaid is still a family favorite around here. Show off your fandom with an Ariel pumpkin. Dreams really do come true! And with a Cinderella pumpkin, you’ll spread the belief in the power of dreams – right from your front porch. Print a Cinderella pattern. I’m not sure why, but Anna isn’t everyone’s favorite! She’s so spunky and full of undying devotion and loyalty. This is a very basic pattern, great for beginners. Print the Anna template. Snow White & the Seven Dwarves is classic! This is a more involved pumpkin carving. You can show off your razor skills with it! Print the Snow White pattern. Princess Tiana shows everyone that dreams are as important and hard work. I love this pattern because it sums up the best part of the movie, a princess kissing her frog! Print the Tiana template. There you go! 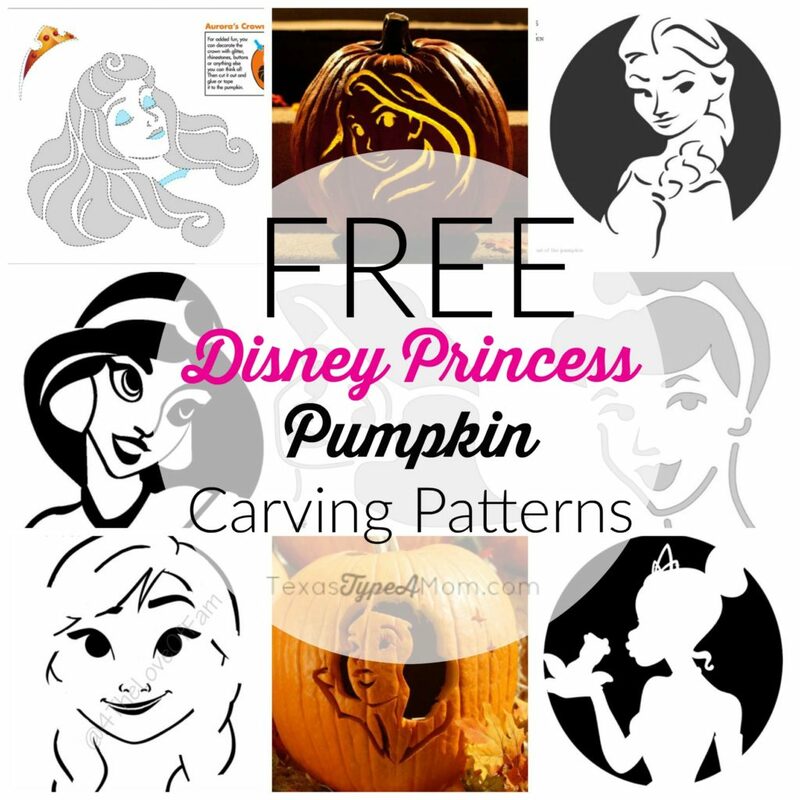 The only question is which one of these free princess pumpkin carving patterns will you use first? !